Thank you for this thing!The link to the site specified in the description does not work, please drop the link to the magnets from aliexpress. Thanks for pointing this out. I changed the link to another vendor offering similar magnets. This is fantastic, especially the SCAD files. I've nearly done making my first set of screw drawers and it's probably one of the most useful practical printing jobs I've done. Finally some organisation for all those screws leftover from building the printer itself and other projects sitting in labelled packets and boxes! I like this project, thanks for sharing. Thank you for taking the time to dig into this issue! Will incorporate as soon as possible! On the 3 bay version of the 2X1 drawers the last bay is practically unusable since the drawer will not pull out far enough to easily access it. If the dividers were turned 90° it would make all of the bays equally useable. This probably applies to all versions, but I've only printed the 2X1 and 1X1. On the 1X1 version of the housing the triangular "stop" that retains the drawer is backwards. Or maybe it's backwards on all the other drawers. I prefer the way it is on the 1X1, with the flat side of the triangle facing out. It is easier to print, and it retains the drawer without making it super difficult to remove the drawer from the housing. Ok, here's what I found: Yes, the 2x1 drawers are indeed wider. Exactly 0.9 mm. Which was confusing me, because this is the width the drawers should have. All drawers. So, the drawers should be 66.8 mm wide and, thus, perfectly matching the inner width of 66.9 mm of the houses. Yes, a tight fit, but that was the original idea. Now, during a code review we decided to decrease the drawers' width to accommodate for 3D printers' tolerances. Some of the STLs are leftovers from the first version, I'm sorry. Will check them all and replace the old ones with new ones. Thank you for pointing out that issue! Any chance for designing an extendable hanging base plate? As in - to attach the plate to the underside of a shelf into which the drawers can be slid onto? that should be doable. What exactly do you mean by "extendable"? say 2 standard sizes of base - 2 drawer and 3 drawer. Obviously they would have rails for drawers to slide onto, say 4 screw holes to attach the base to whatever object (a desk? ), and also suitable interlocking ends. So when the bases are locked together, all the distances are correct for drawers to lock onto the bases AND onto the neighbouring drawers. Obviously two models - one standing and one hanging, to match the drawers top and bottom rails. Edit: my ASCI "drawing" doesn't show up correctly. Hey man, what sort of magnets do you use? Will neodymium 8mm x 1mm with 400g pull be too strong ? A seemingly easy question that is not easy to answer. That is especially because there is a big variance in magnet quality out there. The ones you linked are N35, and that would be fairly weak magnets in terms of adhesion (I think that N35 are the weakest out there). The ones I linked from AliExpress are advertised as N50, thus being pretty strong. But they do not seem to be that strong. So it might perfectly be possible that some good quality N35 magnets are stronger than low quality N50 magnets. But what I can say is, that the ones I used are strong enough to hold the drawers in their houses even when applying some force; watch the video and you'll see what I mean. however plz let me know how to attach magnet to housing. there is only hole for magnet. Thank you! I added an according section about how to attach the magnets to the holes. Here's what I wrote: "I put a drop of super glue on the rim of a magnet, laid it down on my workbench, then imposed the house (or drawer) on the magnet. This way, the magnet and the house or drawer will be on level. Take care that leaking super glue may glue your house or drawer to the workbench. To avoid this I moved the house or drawer in a circular motion. Just long enough until the magnet was sufficiently sticking to the house or drawer." ... I think I should make a small video of the mounting process. Hm. Thanks for the hint! Printing some of these now. Thanks for posting. I found the magnets much cheaper on eBay. I can post a link if people are interested. And a link to comparable 8x1mm magnets (50 pcs) on eBay Germany. Please note that these very cheap offers are very often shipped from China with according shipping times. Opened up the SCAD files, Got the 'missing library' message. Grabbed the library. I am not getting any handles showing up. The houses show up, complete with chamfers on the cylinders, and some of the cubes show chamfers inside the cubes, bur on the single slot drawers, they show only one chamfer along one of the long edges. I'm a bit baffled. Any idea what the problem might be? I assume you used the file "drawer.scad", right? If that is so, did you use F5 to get a preview of the model or did you, prior to that, render the model using F6? I tried both, with the same results. See drawer.jpg. I did play around with your call to chamferCylinder() in the module chamferOval. I copied it into Chamfer.scad and started playing with the values. Eventually, I found out that the parameters were not right. I think perhaps the Chamfer.scad that I used is a different one, or a different version. I have attached it for your information. I am really looking forward to making a bunch of these. Excellent design! Your library is, indeed, newer. Yours is version 0.4. The one I am using is version 0.31. I attach this older version and kindly ask you to try this one out! I scaled the Drawers and the Houses about 250%. Printing with ABS, 75mm/s, 0.65 Layer, 0.8mm Nozzle, 100% Infill, no Fan. The Prints are well, exepting the roundings. I tried changing the temperature, speed, layer height, outher wall count, retraction and so on, but without a success. In my desperation I tried with cooling, and yes, it was better, but the ABS got Cracks. So I changed to PLA, but with same bad prints. The small and big houses are all in the same group, so the settings are 100% identical. The bigger houses are always many times worse in compare with the small ones. Any Idea whats wrong, because on some parts it looks very good (1 from 10), and the others gots really bad. Mechanical issues can't be, all checked already. Never scaled the drawers or houses, so I cannot tell whether your bad prints stem from the scaling or from some other issue, e.g., with your settings. What I can think of: 1) retraction settings or 2) z-scar issues. Depending on your slicer you might be able to see where retraction will happen. If that is the case, try different wall thicknesses. I usually adjust my wall thickness (or shell thickness as it is called in Cura) to that I get a minimum of retractions. Concerning the z-scar I may not be of great help. There are slicers out there that allow you to control where the z-hop happens; my Cura version does not have such a setting, but I luckily had no issues with z-scars so far that could not be remedied by reworking with a cutter knife. Perhaps some other people here have additional ideas to help with your bad prints?! Do you print the houses vertically or rotate them in the slicer? I'm printing a 1x1 housing vertically ( with the back magnet piece on the bed) and its taking forever, with lots of retractions. Did you use these settings? My initial layer thickness is at a constant 0.2mm. Regarding elephant's foot I do not think that changing the initial layer height will solve your issues. Instead I would look for a good combination of print speed and fan settings. Basically, you get an elephant's foot because the initial layers are too soft to carry the weight of the layers that get stacked upon them as the printing process continues. So you can either decrease the print speed or fire up your fans earlier or do both. I'd only change one parameter at a time to see if it has a (positive) effect, then move on to the next setting. They suggest to increase the distance between nozzle and bed to cope with the elephant's foot. In any case it will be a compromise between bottom layer quality and bed adhesion. I tried the new settings at 0.2mm absolutely perfect. The drawers even fit better in the housings now! Going to print a few cubic metres of these now, thanks for such a great design and a swift reply ! Thank you for this awsome drawers! It helped me alot in organizing all the small parts i have in the workshop! How difficult would it be to make some part like, say, the bottom part, but that would screw on the wall? I wish to screw one on the wall every few of them so it's actually strong enough to hold all the drawers. There could be an easy solution without designing a new part: If you can resign from using magnets in all your houses/drawers you could print a house, drill a small hole in the backside exactly at the same spot where the magnet hole would be and use that as a screw hole to screw a house to your wall using a pan head screw. A drawer with magnet hole could just fit though the pan head protrudes. If it does not fit, you will have to make some more space in the drawer to accommodate the screw's pan head. It is hard to tell from the picture you posted what the problem is. Every 3D printer has tolerances and while most of the people seem to be fine with the dimensions there are some that encounter issues. In this case you should try to scale the house up or the drawer down by a tiny fraction, reprint, and check if the resulting prints fit better. I've noticed this too, I think the reason for it not opening far is that on the wider housings the drawer catch is slopped in the opposite direction then the 1x housings. This also contributed to some artifacts on those layers when the print got up there as I wasn't generating an support and I am guessing the overhang is too much there. Tried to print a "Mini drawers ultimate" by zeropage and interrupted the print at the start. I am getting ripples in the first layer. Am I printing with the nozzle too close at the 1st layer? Anyone know? I print with half the normal speed and no fat for the 1st layer but I only have a 1st layerheight of 0.25mm with subsequent layers of 0.2mm. Material PLA, bed temp 60 and nozzle 200. Yes, first layer "ripples" are caused by not enough room to lay down adjacent tracks of filament without it deflecting the print nozzle. First layer extrusion rates can be reduced to compensate - or you can set your z-endstop to allow a little more bed clearance. This is an EXTREMELY common problem - and a surprising number of people don't understand the cause. It is a delicate balance to avoid this problem, yet get a nice dense first layer which has tracks that are nicely fused together without any gaps or thinning between the tracks. Note that adjusting first layer height in your slicer will not always solve the problem. If you increase the first layer height in the slicer, it will extrude more material to compensate. So, you'll end up almost back to where you were. Reducing first layer extrusion rates, or changing the Z endstop adjustment are the only proper solutions. Can you specify what you mean by "ripples"? Can you post a picture? that would help a lot to assess the situation. that is a good idea and there is currently work in progress to build arbitrarily sized drawers/houses as well as to have text labels that can directly be printed on the front of a drawer. That would be an alternative to what you suggested. Yours is, of course, more flexible, so I will definitely put that on my todo list! Thanks a lot mate!!!!! Great work! This printed really nice with no support but nothing but the tiniest of pulls will fit the little slots. Also, the tolerance seemed a bit loose and there is zero resistance when turning the pill container. Might try a scaled up version with a rougher filament. Any hints on print settings are welcome! Many people seem to be fine with the print params I suggested. But all printers have tolerances. Thus it would be helpful if you provided not only print settings or scaling tips but also what kind of 3D printer you use. i edited the scad file to produce arbitrary natural number multiples of the fundamental house unit. i will print a 2x3 tonight, and see if i got everything right. i think i did. everything's coming up milhouse. 2x3 worked great, 3x4 printing now. if you're reading this before this thing gets updated, wait til new source gets posted to make bigger drawers. new ones incoming! i am so close! i intend to send the original author @zeropage my new code, and then they will do some testing to ensure they trust my changes. so, can't speak for zeropage, but next week? as soon as I can lay my hands on @ofloveandhate's reworked code I will do some quick checks. More a matter of quality assurance than not trusting ofloveandhate. ;-) After that I will upload the files immediately. Thus, next week is ACK by me. Hey, I am just wondering if you use glue to stick the magnets, how about slots at the back instead? That way you don't have to glue anything. You would just slot the magnet in and you are good to go. You think of something like this? An interesting idea. The back wall would have to be thicker. The distance between the drawer's and the house's magnets along with the smaller diameter of the outer hole would decrease adhesion. But that might not be too dramatic. That looks awesome! Yeah the back wall would have to be thicker but I think it'll be easier and less actual components, just 3d print, magnet and you're good to go!. You might not even need the hole at the back because of the strength of the neodymium magnets. Any updates on this :) Excited to print one to test it out. In my opinion, under no circumstances should this be printed at 0% infill! I'm using Simplify3D, and when I tried 0% infill with a 0.4mm nozzle, every wall it printed was comprised of 2 perimeters that made no contact with one another, right up to the top layer. I could easily separate the layers with my fingers. Attempts at connecting this piece with another totally contorted the piece and bent it out of shape. I printed another set using Simplify3D's "Allow single extrusion fill" (which fills in between perimeters with a very thin line that connects the 2 perimeters), and the parts came out much sturdier. Also, I'm not sure why there were no top solid layers when I set infill to 0%. I have it set to 3. EDIT: Actually, it appears that changing the infill in Simplify3D has absolutely no effect on this print when I have "Allow single extrusion fill" selected. Only when I select "Allow gap fill" does it make the walls hollow. EDIT 2: The drawers fit perfectly without scaling for me, but the runners are extremely tight when fitting into each other. Once they're in there, there isn't a force on this planet that will separate them! i printed 0% just last night with simplify, and a 0.35mm nozzle. whether they contact or not depends on the infill width, not the nozzle diameter, per se. increase the width, and they will touch. i think 0.5mm should be ok. i think i used 0.42, and love they way they printed. am printing with petg at the moment. i scaled the drawers to 0.995, and they fit beautifully. thanks for taking the time to comment. Please note that many people successfully printed the drawers with 0% infill. It is correct and on purpose that with this setting the inner and outer walls do not connect. Since the drawers are small and usually do not experience heavy stress it is for most use cases sufficient to only have the top and bottom layers closed. Since I am using Cura, I unfortunately can not assist you with the settings for Simplify3D. All 3D printers have differing tolerances with respect to print precision. Some people reported loose runners, others, like you, tight ones. If you are familiar with OpenSCAD you might try to increase the diameter of the slots. Or decrease the diameter of the runners. Send me a message if I can be of assistance. Thanks for the response. I tried to open the scad files, but when I tried opening a few, all that it displayed is an oval in the preview window. Also, shouldn't there be a "Chamfer.scad" file? I noticed all files say "include " at the beginning, but I get an error saying there's no such file. Yes, you'll need to install the Chamfer library from here https://github.com/SebiTimeWaster/Chamfers-for-OpenSCAD to get the SCAD-files compiled correctly. indeed. i put a symlink in the folder, to the chamfer file. saves precious disk space! Hey how did you get those labels? Do you have a label maker? Awesome design btw!! Thank you! The labels have indeed been made with a label maker (Brother P750W). Very nice !! Remember me an old electronic shop plenty of drawer with resistances,condensers,transistros,ics....and so on. I'll make some for a try. Don't be shy, give it a try! These print perfect. How about a 2x2? double the width. A bit tight fit if 100% infill is used, but making drawers 1% smaller worked perfectly for these. It would be nice to see 2x1 and 2x2 variants also. I have an STL for a 2x1 house available. No drawer yet. Did not print the house yet. Would you like to give it a try and tell us how the print turns out? I suspect that the walls could be a little unstable. But as already mentioned: No hands-on right now. Drop me a PN if you want to try it out. What are the dimensions of these drawers? the 1x1 house is 38.5 x 20.5 x 56 mm (width, depth, height). the 1x2 house is 38.5 x 38.4 x 56 mm (width, depth, height). Usually, you can see an object's dimensions in your slicer. What slicer did you use? Cura slice and print well. works fine for me in both slic3r and s3d. You need to use one perimeter, 0% infill. can print it easily in 0.2 and 0.15mm layer height. 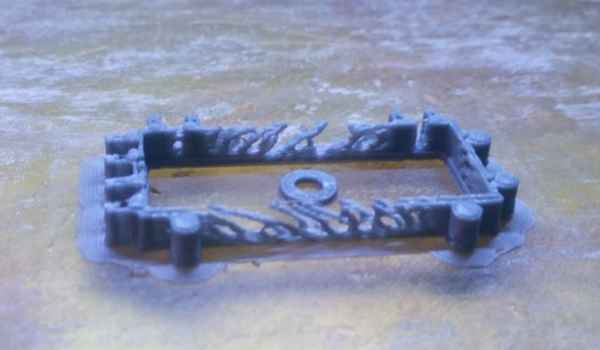 Only the small features from the connectors are a bit tricky to get them printing well depending on your printer. but slicerwise no problem. was just playing with the setting to avoid the gap filling but still get a top surface. I use Cura only. Is there a "layer view" or alike in Slic3r/Simplify3D. How does the model look like in layer view? You tried to print "MD_House_1x1_magnet.stl", right? I ran the STL trough makeprintable.com and uploaded a repaired version as "MD_House_1x1_magnet_REPAIR.stl". You might want to give this one a try with Slic3r or Simplify3D. Thanks for the great project, I will start printing. The are about 10U$ x 100 magnets, which is way more than ali, but, don't need to wait 1 month or so for it. thank you! Yes, waiting for shipments from China can take very long. I experienced shipping times from a week to months(!). Have fun with the drawers! Gonna try to make some of these soon. Do you wall mount them? Until now, the drawers rest on my workbench. If you use the drawers with magnets and you happen to have something metallic on your wall, you could simply hang-up the drawers using magnetic force. With a peg board or a french cleat storage system it should not be to difficult to design an appropriate mounting mechanism. I received magnets today from Ali :-). How you glue them? In inside drawer it is easy, but in the hole of outer shell? I put super glue on the edge of the magnet, lay it down on a flat surface and then sheathe the hole of the house over the magnet. Work quickly or the magnet will stick to the surface. After that I apply additional super glue on the outer rim of the magnet on the backside of the house. The colours are fantastic. Roughly how much PLA does each draw and holder use? Whoa, never checked this! Cura says that a 1x1 house (with UM2 3mm filament, 0% infill, 0.4mm thickness, 0.8mm top/bottom, 0.16mm layer height) takes approx. 1 Meter / 8 gr of filament. The 1x1 drawer 1/2 Meter and, yes, 0.4 gr. Thus, I would be able to print ca. 60 1x1 houses and ~60 1x1 drawers with a 750g spool. Hi, these look really nice. How do I change to square magnets from the rounded ones. Where do I make the change in the .scad file? There is a new boolean variable squareMagnet. If set to yes, scad will draw a rectangle with an edge length of magnetSize. If false, scad will draw a circle with a radius of magnetSize. You would have to apply changes like this to the houses, too. You must be Hulk to assemby them together. All houses and drawers on my pictures were solely printed with PLA. And I'm definitely not the Hulk-type of guy. It depends on your print settings and, of course, accuracy of your printer how tight the runners fit into the slots. If you are familiar with OpenSCAD you can easily modify the file "MD House regular.scad" and reduce the diameter of the runners. The parameter is at the top of the file "runnersDiameter". I was fine with 2.85mm. Reduce this to, e.g., 2.8 or 2.75 and try it again. I would require a picture of you prints to decide which value might be the best for you. But this is, usually, a matter of trial and error. Additionally it always helps to know what your print parameters were. Drop me a note if you need further assistance! with ABS was all great with original settings. Many thanks for your pictures! I have made them at 150%. Had to do a little shaving on the locking mechanism, and add a touch of lubricant. But on a plus, they are not coming apart, probably ever again! Are you guys scaling this stl up? Didn't realize how small it was until i started to print it. Why don't you scale up using your slicer? With Cura and an, e.g., UM 2+ you can go up to 365% yielding a house with approx. 14 x 7.4 x 20cm. Let me know how the runners and slots work in a scaled up version! The locking mechanism looks very nice. Mini Drawers Ultimate by zeropage is licensed under the Creative Commons - Attribution - Non-Commercial - Share Alike license.